This is the third book in the Vital Issues Series which I have reviewed. These all contain past articles from Bib Sac and have all been excellent. The three areas with which this volume deals are problem areas, creation science and archeology. 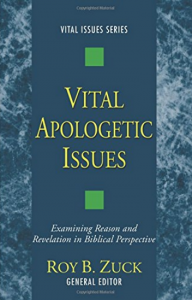 The first section has an excellent article by Norman Geisler on Johannine Apologetics. He presents the view that John is a court case containing legal language, seven signs and many human witnesses. The second section is a defense of special creation vs. the various views of theistic evolution. This is a growing problem even in Christian school curriculums. The third area deals with the historical accuracy of Old Testament dating against the back-drop of current archeology.